American brands of orange juice on Japanese supermarket shelves. To explore this virtual reality scene click on the Audio-Video link below. As it required little labor and produced a large crop, mikan came to be grown in large acreages in areas of Japan with a year-round warm climate such a Wakayama, Kumamoto, Nagasaki, and Ehime. After cultivation in greenhouses began in 1968, mikan was no longer the symbolic fruit of winter. All this led to overproduction, and growers had to cut back. In addition to the increasing popularity of apples, grapes, and pears, imported oranges marked the end of the dominance of mikan in the Japanese fruit market. Since 1978, Japan and the United States have experienced severe trade disputes over agricultural products. While Japanese farmers bitterly resisted foreign pressures, the import of oranges was liberalized in 1991 and orange juice the following year. 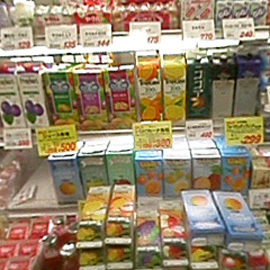 American brands of orange juice in cartons are now an everyday sight in Japanese supermarkets. And both Japanese and foreign passengers on Japanese long-distance trains still like to buy small mesh bags of mikan to peel and eat during their journey.